Okay, so here is something terrible to admit. In all my children’s literature/horror literature loving-ness, I had never (until recently) read anything by Neil Gaiman. I know. I got The Graveyard Book for Christmas last year, and I’m still not even a hundred pages into it…for some reason, I’m having a really hard time connecting to the story. 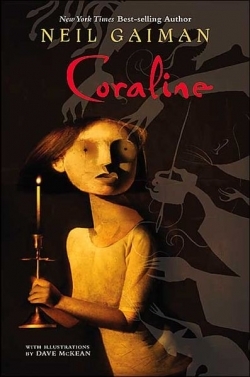 However, I really believe that I would love Gaiman as an author, so I decided to start small and read Coraline. I loved this book! It was definitely a quick read, but I could have certainly read much more of Coraline’s adventures. As I read it, I clearly saw this book as Alice in Wonderland/Through the Looking Glass meets The Nightmare Before Christmas. Coraline as a character is very mellow, curious, and has an understanding of the world that goes beyond her years, which I something always like in my MCs. She very much reminded me of Alice, and the creepy nature of the world that starts fascinating but ultimately isn’t meant for Coraline to stay in made me think of The Nightmare Before Christmas for sure. This story definitely had its creepy moments. The button eyes of the other world people, the weird morphing of the other world as it began to fall apart, the spirits of the ghost children locked in the (very Carrie-esque) closet…they were unquestionably dark, and I loved it. In my experiences, you don’t see true darkness in children’s literature anymore…things are toned down from the days of Peter Pan, where the lost boys count how many pirates Peter has killed as he kills them. Perhaps there are other stories like these out there from modern authors, but I haven’t come across them. I don’t have a problem with scaring kids…some of my best memories of my childhood are from being afraid, and dealing with those frights at a young age has allowed me to deal with a lot more as an adult. So, needless to say, I was ecstatic for the flavour of this book. I have a long to-read list at the moment (when do I ever not?) but I am definitely looking forward to reading more of Gaiman’s works. The next on my list is going to be Mirrormask, which I’ve got to listen to in the car for when we drive up to go camping on Tuesday! I have to admit I haven't read any of Gaiman's work either (although I've been meaning to!). Nice review – I will definitely put this near the top of my reading list. I know…he is such a major name in the genre, but I'd just never happened to meet with any of his reads. Definitely enjoyed Coraline, though, and am currently listening to Mirrormask, which is similar, in a way.